By signing up to the Africa Investor Executive Club, members enjoy a suite of tools, information and relationships to help investment and business leaders network and understand the evolution of investing in Africa. The product enhances their performance, competitiveness and provides a fact base for operational decision-making at the continental level. 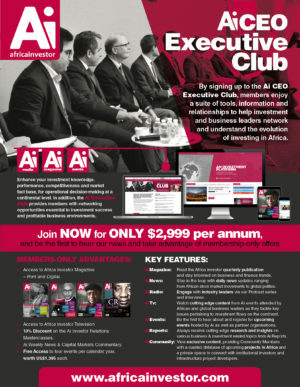 In addition, the Ai Executive Club provides members with networking opportunities essential to their success and profitable bilateral meetings in an ideal business environment.